I had contemplated about using source control before. Those deal with more of the software side of things. I want to explore the physical set up a little. I don't have the definitive answer, just thinking out loud perhaps. The client is considering a ramp-up of development efforts (good thing). We were asked to think about an environment to allow parallel development. 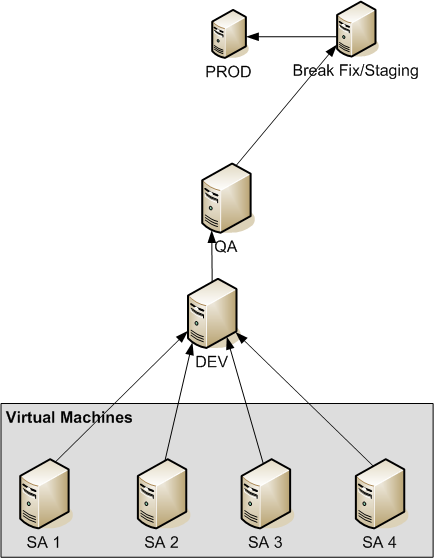 This is no easy task in OBIEE as the RPD can be a bottleneck. While talking about it though, it sounded a lot like classic software development and source control. You pull down the code locally, fix/create/update it, and then merge that up into your trunk (subversion lingo anyway). You merge it up into a common repository. Find the common code (init blocks, connection pools, etc) shared by all subject areas. Especially relevant if setting some variables or something for security. 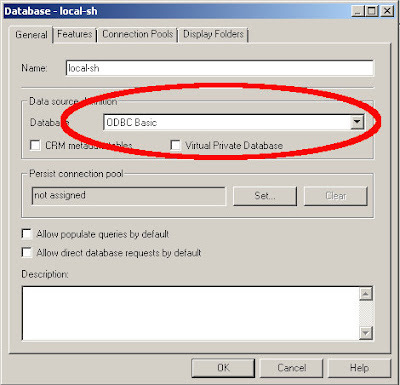 Create virtual (or physical) machines with the full OBIEE environment (services, rpd, web cat) set up for each subject area and only that subject area. Of course this would include all components identified in step 1. Easier to import than merge? How do you handle physical tables shared across subject areas? I need some good contrarians out there to discuss this with. I don't know if this has merit or not, but I wanted to put it out there. Good or bad, I'm OK with. The goal is to give the client the most reasoned, researched, supportable analysis that I can. I learned something new today...you can't use week date format qualifiers in TO_DATE. Lo and behold the Error messages manual didn't have it (at least where I would expect it). Now I just need to figure out how to transform that week into a month. I'm trying to generate some test data for a quick...test. I switched to using SYSDATE as that would allow more more flexibility to transform the other way. Oracle's latest acquisition has created a need for an Oracle DBA in Philadelphia, PA. 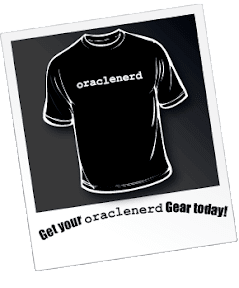 The Oracle DBA will be supporting multiple environments from Development, Quality Assurance (QA) and Production databases running Oracle 10g in a clustered environment. Experience working in a production UNIX/Linux environment is required for this position. Experience in performance tuning, change implementation, backup and recovery, monitoring and installation are key requirements. Candidate will also be expected to provide application-level support for our in house J2EE applications running on Tomcat and OC4J. Ideal candidate will be a self-starter and a team player with a strong organization, process and communication skills. This is a permanent position, not a contract. No 3rd parties please. No H1's or L1's. Computer Science, or related science/Engineering degree (B.S. or equivalent). At least 2 years of experience with Oracle Real Time Application Clusters 10g or 11g with ASM or NFS. Familiarity with Oracle’s Business Intelligence suite, Informatica and J2EE administration is a plus. Will require after-hours or occasional weekend work to make changes during outage windows. Compensation is negotiable and based on experience. Relocation package is not available. When generating SQL for testing, make sure you set the database to the database you will be running against. I found this out the fun way, of course, by going through, grabbing the SQL from the logs, and then modifying said SQL to run against Oracle. I should have paid attention to that "Check Consistency" warning. mostly small stuff, but annoying none-the-less. 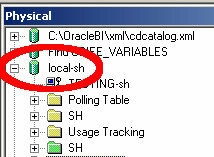 Strangely (to me anyway), this was the SQL submitted to an Oracle database...without errors. I'm guessing that somewhere, either in OBI or in the driver itself, the SQL is rewritten. After I realized what had happened, I went back into the RPD and updated the database properties. Then selected "Revert to Defaults"
Run the Consistency Checker again and voila! So don't waste your time like I did. 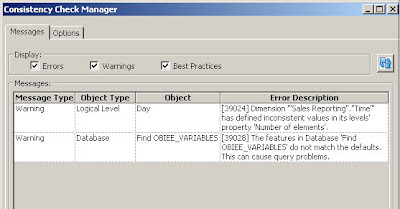 Make sure you use the Consistency Check Manager and make sure your database defaults match. In Dan Norris fashion, I am announcing the acquisition of Thomas Roach by Oracle Corporation. 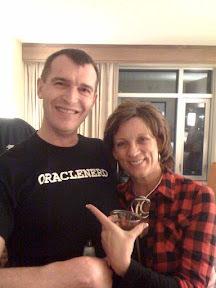 I've had the please of knowing Mr. Roach since before moving to Tampa as he was the President of the local users group, Suncoast Oracle Users Group (SOUG). He's also helped me out numerous times in both an advisory role and...well, just getting stuff done for me. A few weeks ago I got to help him by letting him rehearse his MAA presentation on me. That apparently sealed the deal for him. Oracle Corporation flirted with acquiring him late 2008, but didn't pull the cord. I've been teasing him the last few weeks about anouncing him as the Tom Kyte successor, as he'll be working in the Public Sector group that Mr. Kyte worked for a few years back. He said he didn't want the "Rittman Effect" so I am playing nice. Mr. Roach is a great guy and this position (whether Mr. Kyte's old job or not) is very well earned. Congratulations Mr. Roach. Perhaps you can help out Mr. Kyte with his small niche site...since you share the same name. I'm trying to get an Oracle instance configured with OBIEE for an Exadata POC. Mostly, it just getting all these disparate "security" tables into a single database. As I was building out some reports to drive some iBots, I kept getting connection problems. I thought it had to do with the fact that I had multiple Oracle clients installed (10g and 11gR2), as I had problems with that before. Copyright (c) 1997, 2010, Oracle. All rights reserved. just fine, but I couldn't connect. I then removed any references from the PATH to the 10g client. Ah...interesting. The server isn't even running. WTF? I then edited that, removing the FIXED_DATE setting and voila! I was up and running again. Does embedding an analytic function into a view cause a WINDOW SORT every time the view is called? I say no, only if it is specifically referenced. Now if I just select the columns I want/need, will Oracle perform the WINDOW SORT? 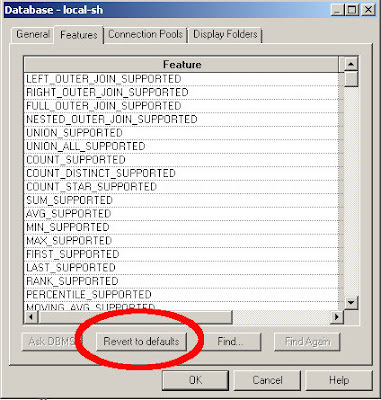 Oracle is smart enough not to perform the WINDOW SORT if the column is not selected. Saying something like that really endears you to a vendor. Thankfully, I know Jeff Smith of Toad from his recent trip down to Tampa. At dinner later that evening, I told him as much. He finally got it out of me that it isn't really Toad's fault, but the developers that use it. I agreed. Unfortunately when I said it at COLLABORATE (jokingly of course), one of his colleagues heard me. Uh oh. Anyway, I had to explain why it is I "hate" Toad and think he was mostly happy with my answer. Ultimately, a tool that helps you increase your productivity is a good thing. 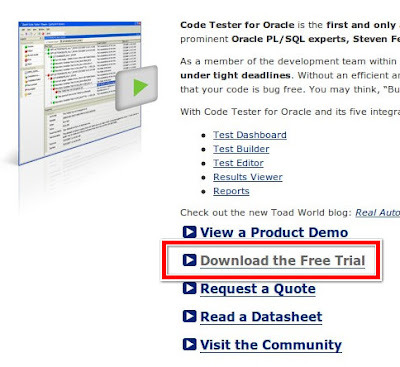 I like and have used the DBA pack that comes with Toad. However, many "developers" I have worked with can't live without Toad...and that's where I have a problem. So trying to be fair, I asked Mr. Smith to walk me through Quest Code Tester. I "like" testing and think it is one of the bigger problems in the database developer community; in that we don't do it very well. Java, .NET, and many others have it built in (mostly anyway) to what they do. How many times have you seen a database developer run through unit tests on his or her code? I've seen exactly 1 shop (where I learned it). 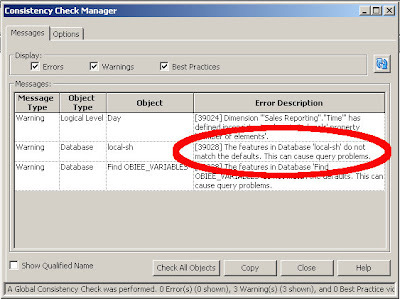 From that demo, I would say it has much, if not more, of the functionality in SQL Developer. I haven't had a chance yet to really use that one either. I covered everything conference related early today here. My stay at the Excalibur was uneventful. I wouldn't stay there again, unless it was free and I had no money. I'd still have to think about it though. The walk from there to Mandalay Bay however was...interesting. Not once did I navigate the maze without having to backtrack. I know/understand that is on purpose...but it's still annoying. Maybe that's taking marketing (or whatever it's called) just a bit too far. If people want to gamble, they'll gamble. Last night I got lost in the Luxor for an hour. I could have gone outside, but I was determined to figure it out. I had help from beer too. The other highlight of my day was eating lunch with Mr. Floyd Teter. No adjective is descriptive enough to describe him...I'll settle for Awesome though. I did manage to get some shopping in today...I hate shopping, but the family deserves something. So I got them all "My dad/husband went to Las Vegas and all I got was this lousy T-Shirt" t-shirts. Since my flight didn't leave until 1 am (Friday morning), I had time to kill. So I parked myself in front of a slot machine and within minutes lost $10. I then played roulette, only to lose $20 in 3 minutes. I blame Mr. Mark Rittman...he paid me for the iPad I got him in cold, hard cash. It burned. It had to be spent. I think it was payback for my little stunt the other day. So I left the hotel(s) and went to the airport so I wouldn't spend any more money. Though those stupid slot machines behind me are calling my name. I can't wait to get out of here if only for the silence. I finally managed to make it to the OEM 11g release session, which was just a satellite feed from New York that everyone else in the world could see. However, had some live Oracle people here to answer any questions after the presentation. Unfortunately, I did not get their names as I was 40 minutes late. I haven't used OEM in years so it was all new stuff to me. The additions did look pretty cool though especially the ability to drill down into specific applications to locate performance problems. I stayed to listen to the questions people had as sometimes that's the most interesting stuff. I then headed over for lunch with Mr. Floyd Teter and we were eventually joined by Dave Ferguson and his wife Paula. We ate at Burger Time which was quite good. Mr. Teter's enthusiasm is infectious to say the least and his energy level is out of this world. It has been an absolute pleasure to get to know him in real life. Somehow he talked me and about 10 others to join him in a podcast with Mr. Bob Rhubart of ArchBeat fame (and the best voice ever) to discuss our experiences at COLLABORATE 10. Mr. Rhubart said that he would have it posted sometime next week. I'll link it up when it's released. The day started out with the realization that I pulled off the best (COLLABORATE - self annointed) prank ever. Twitter was...all atwitter about the fact that Mark Rittman was Oracle's Person of the Year. Of course it wasn't true. If you look at the picture, you'll realize that he's wearing exactly the same clothes in the magazine cover as he is in real life. I ate lunch in the exhibition hall. Sat down at my table, opened my soda and it exploded. Everyone at the table seemed to ignore me after that. What can you do? From there I spent the next 2 hours writing and "relaxing" (sitting down). Then I went to the Exadata SIG. On the way there though...I finally met @tyf who spotted me (probably my dirty oraclenerd). We had been trading tweets for the last couple of days but could never seem to meet. Within about 3 seconds I realized that she was one of those rare, awesome people. You know, the ones where you instantly feel comfortable with? So I asked for a picture with her which turned into an absolute fiasco. 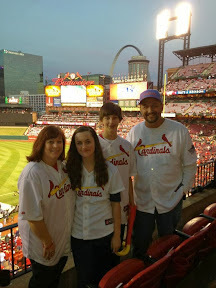 We tried twice holding the camera out in front of us...and I'm not very good at that apparently. I finally asked a passerby to take a picture and he agreed, only to spill his ice all over the floor at the base of one of the escalators. We kicked the ice out of the way and finally got a picture. After an informative Exadata SIG meeting where I got to meet Arup Nanda (again actually) and a couple of Oracle folks including Jean-Pierre Djicks (JP) of The Data Warehouse Insider blog. With a 2 hour wait until the Beach Party, I headed back to the room. On the way back, I ran into Floyd Teter and we talked for a bit before being hassled by one of the "wives of fishbowl" and her husband Rick. I then headed back to my room and got completely lost. Obviously I did make it back...but it took close to an hour. I met Debra Lilley today. She's the keeper of Stanley. Of course I asked if I could take a picture with Stanley, you know, oraclenerd meets Stanley photo. Tommy: Richard? Is this your coat? Tommy: Fat guy in a little coat. Fat guy in a little coat. Tommy: [singing] Fat guy in a little coat. / Fat guy in a little coat. Richard: Take it off, Dickhead, I'm serious! It wasn't quite Universal, but I had fun. What was to eat? Scallops...mmmm...scallops. Due to "inclimate" weather, it had to be moved inside. By "inclimate", I mean it was only 60 degrees outside. Sadly I couldn't find the OAUG crew...the helped me out quite a bit this week (as well as getting me a pass). Allison Dixon was my laison and she was awesome. After the lights were dimmed (remember that in kindergarten? ), we sat outside the room and played...beach ball. Yeah, it was interesting. Then tiki statues somehow were incorporated into various dances. Interesting indeed. From 4 to 5 today, I attended the Exadata SIG. Dan Norris was supposed to be there, but he got caught by the ash cloud from the Icelandic volcano. Here's what I got from the meeting. 1. The database software that runs atop the hardware is 11gR2. Exactly the same software that I run on my OEL virtual machine. It is no different. 2. Exadata is a "game changer." The word I was thinking about was it represents a paradigm shift. What do I mean? Well...the consolidation of roles means that IT has to figure out how to deal with Exadata. Who's going to be the point person on support issues? If you read that article I just linked to, it talks about the consolidation of roles...meaning that the DBA can (should?) handle all things Exadata. In other words, no system administrators, no storage administrators...just the DBA. From my point of view, this is exactly what technology is supposed to do. I'm hoping to volunteer for future endeavors with the group...you'll be duly notified. I managed to attend a session today. The basic gist of his presentation was that if you can understand HTML and how a page is rendered, you can do just about anything you want with the page. - Way To Solve Multiselect Prompt Bug - Mr. Ranka did not actually get to this one, but it's definitely worth sharing. Sadly I didn't write down the rest of the examples. Not only was I the "AV geek", I was also the collector of names/business cards for prizes to be handed out at the end. Bex Huff - Bezzotech and IRA Merge Into One! The EPPM Blogspot - Thank you for joining us @ Collaborate! IOUG blogs by Unknown - COLLABORATE 10: Users Rule! These were pulled mostly from the OraNA feed with a few coming from the Oracle Blog feed. If you know of any others, please let me know and I'll add them here. Despite going to bed at around 4 am Vegas time (7 am my time), I managed to get up around 8 (Vegas time). I headed down and visited with some of the vendors to get some information on what they do, what they provide, etc. I found a spot in the main lobby and parked myself there to start writing. Ten minutes in, this guy comes over and we started to chat. He had just given a presentation on the MODEL clause so we spoke about that for a few minutes. His name was John King, which is my mother's maiden name. Talked about some other stuff before he took off for his next session. Shortly after he left, this woman sits down next to me and we start to chat. I notice she has an ODTUG shirt on and I ask her if she is a member. "I'm on the board of directors." How cool. I then told her about pestering Mike Riley (and then Mark Rittman) about getting a blogger pass to the event. If you've seen the site recently, specifically the "T-Shirts in the Wild" slide show at the top right of the page, you would have seen David Peake (APEX Product Manager) and this other woman. Turns out I was sitting next to the "other woman". Barbara Morris was her name...I quickly showed her that her picture was up on my blog (since replace by Superman, Brian "Bex" Huff). Small freaking world. When I was rested up, I went back into the exhibition hall where I ran into Mr. King again. I asked him if he was stalking me. He denied any such behavior. The exhibition hall was closing so that could prepare the food (and beer) for the 5 o'clock rush. I had asked him if was leaving and he said, "No, I'm an Exhibitor"
I then told him about pestering Mr. Riley (and Mr. Rittman) and told him I had met Mrs. Morris just after I first met him. I'm thinking that I was meant to attend ODTUG as a blogger...or at least that's what the universe was telling me. Had my requisite beer(s) while perusing the exhibition hall finally ending up at the IOUG "booth"
I then followed these young ladies to the BIWA SIG event where many more IOUG workers were hanging out. This is also where I found out about Mark Rittman's "Person of the Year" award too...so I'm glad I attended. After that it was off to the Fishbowl Solutions and (finally) an early night for me. In what appears to be, to this writer's knowledge anyway, the first "Person of the Year" has been awarded to Mr. Mark Rittman. Mr. Rittman, a shy man by nature is an Oracle ACE Director in the BI/DW world. He's also one of the principal owners of RittmanMead consulting. Mr. Rittman was given this high honor in a private ceremony in the Oracle Magazine party this evening. Sadly, this reporter was not invited to the event to cover this momentous occasion. Congratulations to Mr. Rittman. His wife, Janet, was on hand (which tells this reporter that he knew about the award prior to coming to Las Vegas). The only comment I could get out of him was, "I am very humbled by this prestigious award" (spoken in a British accent of course). No conference would be complete without the vendors. I don't have exact numbers, but there seem to be quite a few. If I had to guess, it would be around 100. So far, I've mostly visited the ones where I know someone, but today I will try to get around and meet more of them so there is no bias in my reporting. Some may dislike the vendors, and I may have said the same at one point in time, but I have come around (or turned to the darkside). Back in 2004 I raised 50K to start my own business and managed, somehow, to keep it going for almost 2.5 years. I understand that the marketing and sales part is very, very difficult. If you are one of those vendor haters...I'll just say they give away cool stuff, mostly. There are a few iPads, Kindles and other such cool devices being raffled off. Just give them your contact information and your good to go. Here's a list, and pictures, of the ones I have visited so far. Bezzotech is a St. Paul-based software consulting and development firm, specializing in Oracle's Enterprise Content Management product suite, formerly Stellent. The name Bezzotech is derived from the word Bezzo, which is a 17th century Italian coin. This name is a constant reminder that technology is worthless unless it can deliver genuine value to its users. Originally implementRadvantage, The acquisition of Bezzotech Inc, has fused two of the most respected and experienced Oracle Enterprise Content Management solution providers in the industry into THE Premier Oracle ECM Solution Provider. implementRadvantage was founded by Jason Clarkin, who has been a leader in delivering Oracle Enterprise Content Management Solutions to clients around the world over the past decade. An avid contributor to the ECM community, he is a moderator of the "intradoc user group" - a user group focused on Oracle Enterprise Content Management. He is also a speaker, sharing his knowledge of Content Management at such conferences as Crescendo & Collaborate. implementRadvantage has grown into a full service consulting company, attracting some of the most experienced and knowledgeable ECM talent in the industry. Bezzotech Inc was founded by Brian "Bex" Huff, who was a senior software developer for Stellent, before it was acquired by Oracle. 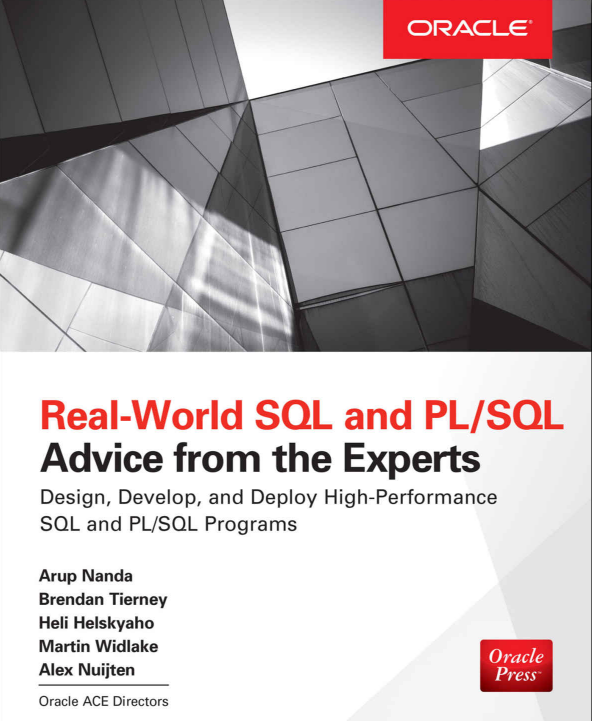 He is the author of The Definitive Guide To Stellent Content Server Development, and was awarded the title Oracle ACE Director by Oracle for his work in the developer community. This combination of talent has created a ECM "Dream Team", that can be put to work for you today! I got to torture these guys for awhile, threatening them with the telling of one of my most favorite stories. I think I needed a few more beers though. When I initially read their press release and I saw mention of EDI, I about threw up...I had the wonderful experience of working with some of the healthcare 820 and 835 formats. Thankfully, their software would save me from such torture. SEEBURGER is a leading provider of global business integration solutions designed to optimize transactions throughout the extended enterprise by automating trading relationships with all partners, regardless of their size and technical resources. Launched in 1986 to provide integration solutions to the automotive industry in Germany, the company today serves more than 7,800 customers in 50+ countries and more than 15 industries through its flagship B2B Gateway and related products and services. SEEBURGER has global offices in Europe, Asia Pacific and North America. This is where the famous Billy Cripe went to after leaving Oracle. Guess what he was wearing today? There is no easy "About Us" section for me to copy and paste in here, check out their site for more information. I did receive a brief demo of their iPad application which was very cool. I'll write about more in Part II and Part III. Yes, it's 4 in the morning. Yes, I'm still on east coast time. Yes, I'm tired...but I'm having fun. First, a special nod to Larry (@larry_slo) from Perceptive Software...he hooked me up with a USB charger for my blackberry. I can now maintain contact with the family without having to resort to extraordinary measures. So I asked the security desks at both the Excalibur and Mandalay...and they had a hundred different chargers, just no BB chargers. I then wandered up to the OAUG Headquarters and asked them. Allison Dixon (@COLLAB_10_OAUG) came to my rescue again and helped me to get a temporary charge. Then Larry came through big time with the loan. With phone ready, I was able to go through the exhibition hall with no worries. First stop, beer. Tecate. It was 5...and everyone else was doing it, so why not me? Besides, I was asked to deliver one to Jeff Smith (@hillbillytoad) and Todd Sheetz (@toddsheetz). Almost forgot, I am no longer an Oracle employee (imagine that, me with a short stint somewhere). That was Allison's doing. OAUG staff is awesome. I also met Craig Shallahamer of OraPub fame, who presented at SOUG a couple of weeks ago (I missed it as I was out of town). He had eyes and legs...I don't eat shrimp like that. Great day...I'm exhausted...going to bed. Start over again tomorrow.